“Civil society needs to have both head and heart. If all you have is bleeding hearts, it wouldn't work. 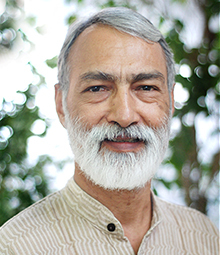 If you only have heads, then you are going to dictate solutions, which do not touch the human chord.” Deep Joshi’s invaluable contribution to the NGO movement in India testifies to this belief. Recognized for his leadership in bringing professionalism to the NGO movement in India, Deep Joshi was awarded the Ramon Magsaysay Award in 2009 and the Padma Shri in 2010. Deep Joshi co-founded the non-profit organisation, Professional Assistance for Development Action (PRADAN) of which he was the Executive Director till 2007. PRADAN is an NGO that promotes rural livelihoods across seven states in India. Taking HR and bottom-line profits as seriously as any blue-chip corporation, PRADAN recruits top professionals, including IIM and IIT graduates, and puts their expertise to work on projects to enhance productivity and promote rural livelihood, via animal husbandry, dairy farming, and sericulture. The initiative has helped 68,000 families support themselves, and is a movement that keeps growing. Deep Joshi has served on various policy-advisory committees of the Government of India in various capacities, including the National Advisory Council. He has served as the Chairman of the Institute of Rural Management, Anand, and the National Foundation for India (NFI) and the Rashtriya Gramin Vikas Nidhi (RGVN). He serves on the Boards of several rural development NGOs. Deep Joshi is a mechanical engineering from MNNIT, Allahabad. He has a Masters degree from MIT, USA, and MBA from the Sloan School of Management.